Anna Fox is agoraphobic, unable to leave her home. She hides away and has her groceries (and plenty of wine) delivered. She spends her time watching old suspense movies and spying on her neighbors. When a new family moves in across the way from her Anna immediately starts watching them through her camera lens. By all looks of it they appear to be the perfect family; a father, a mother and their teenage son. But when Anna looks out her window one night she sees something she shouldn’t, something horrible. When Anna attempts to contact the police about what she saw, her world begins to unravel. As the reader you begin to question Anna’s memory, her ability to discern fantasy from reality and you begin to realize something is off in Anna’s family as well. 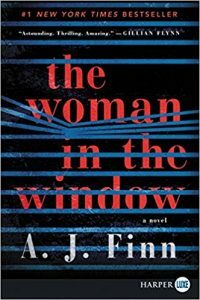 I love a good unreliable narrator and The Woman in the Window is a superb twisty thriller. Finn sets the story against the background of film noir seamlessly. The level of Hitchcockian suspense is so perfectly delicious and chilling that every time I had to put the book down I just couldn’t wait to get back to it! This entry was posted in Reviews and tagged Film Noir, Heather, Mystery, Suspense Fiction on June 15, 2018 by heatherlee.